Scott, you may remember, is attempting to visit the 500-plus stations on the Northern Rail map. That's proper visiting, not passing through, with a photo of himself taken in front of every single station sign, and with the whole thing blogged for posterity. To add to the challenge he's walking between some of the stations and riding between others, ideally alternatively where hiking routes permit. A year ago I joined him to help tick off five stations on the line to Lincoln, and earlier this week I went back to help complete five more. This time Scott's target was the Hope Valley line in Derbyshire. This is the main railway link between Sheffield and Manchester, cutting through the remoter parts of the Peak District, and offers a lifeline to various communities along the way. But midweek off-peak the trains run only every two hours, which makes visiting all the stations rather trickier. 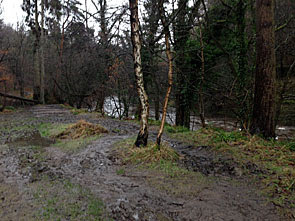 And January isn't the best time of year to visit if you plan walking, especially after an especially wet spell. Still, we like a challenge. Here's my report on the first stage of our day out. Grindleford station, like many in Britain, isn't actually in the place it's named after. Grindleford's nearly a mile away, up a lane and down into the valley, on the other side of the River Derwent. Instead the station is located by necessity at the foot of Padley Gorge, where one of the UK's longest railway tunnels emerges from the hillside, ideal for ramblers if not for residents. A few resilient residents live nearby, many of them in former railway cottages alongside the line, but the main building of note is the legendary/notorious Grindleford Cafe. Based in the station's old waiting rooms, this eaterie was ruled for many years by eccentric owner Philip Eastwood. He had, let's say, firm views about proper behaviour which manifested in stern tickings off and a variety of passive aggressive notices. "Don't Be Rowdy, Behave Your Best." "The Outside Tables Are Not Just For A Rest, They Are For Customers". "This Is A Serving Hatch, Not A Viewing Gallery." And heaven forbid if you'd requested mushrooms with your cooked breakfast, because they were decidedly off-menu as part of Philip's campaign against vegetarianism. 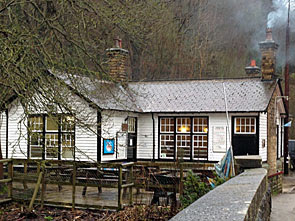 He died in 2007 and the cafe is now in the capable hands of his son, who maintains impressively comprehensive opening hours, with the chimney belching away merrily as we arrived. But was there time to go inside? Alas no, because the timetable demanded were at the next station up the line in either one hour or three hours time, so off we duly trudged. It must have been rush hour because at least two vehicles attempted to pass us on the narrow bridge across the Burbage Brook. They were resilient country vehicles, appropriate for a rocky dead-end lane miles from the nearest Waitrose. Their owners' cottages backed down to the railway line, which is a major freight line as well an express inter-city route, so residents' peace must be shattered several times a day and night. Further down the lane was a tall blocky building which looked like a disused mill but was (I discovered later) Padley Chapel, grade I listed and formerly the gatehouse to a lost medieval manor. Opposite this was a Peak District National Park ranger's outpost, with a van parked outside, and eventually a footpath leading off across the railway. So far, so easy. It was at this point that I decided waterproof trousers would be appropriate. The path ahead was proper muddy, conditions to be expected after a particularly torrential January, and my jeans would be changing colour within minutes if unprotected. I wobbled and squeaked to pull the damned things on, while Scott wandered down to the footbridge and smirked. And then we were off down a field, descending via what we hoped was the right route to the banks of the river below. In summer I imagine this landscape is idyllic, apart from the sheep droppings making picnicking particularly inadvisable. Mid-winter it was a sheen of grass concealing a quagmire beneath, and we squelched and splattered our way towards a gap in the dry stone wall. Here of course the mud was even deeper, thanks to the repeated patter of tiny feet, requiring deft footwork to avoid covering our boots in several inches of brown. We hoped that the track along the banks of the Derwent would be easier going. Alas no because geography decreed that a waterside path would be as muddy, if not muddier still, and so it proved. The trickiest section was through Coppice Wood, a National Trust plantation in a particularly steep section of the valley. Sometimes it was possible to step into the undergrowth to avoid the muddiest sections of the path, other times there was no choice but to stride through mostly water. The river was rushing by, somewhat turbulently, with a main road occasionally visible but unreachable on the opposite side. At one point a small brook tumbled down the hillside in a potentially scenic manner, but we had to continue through the quagmire if we were to have any hope of catching our train. Exiting the wood a massive puddle blocked the path ahead, so we diverted into the neighbouring field (which was only marginally more solid) and nipped back through the dry stone wall when appropriate. There followed a yomp through damp riverside meadows, scattering a handful of sheep and diverting round ponds that don't normally exist. I'd hate you to think this was an ordeal, quite the opposite, but ground conditions certainly didn't enhance our progress up the valley. Only when we finally reached a row of cottages and joined the lane that links them to civilisation did the walk genuinely become easy again. We passed a nervous-looking dog, who clearly hoped that one of us might throw her stick, but was sorely disappointed. We had to dodge out of the way of the postman, driving his van down to the cottages and later back again. And all the time we were watching the railway line above in case our train decided to rush through before we'd reached the station. A whistle worried us for a while, but that proved to be merely the Manchester express, and our stopping service would be following on behind. At last we reached the main road and began our final climb along firm pavement towards the upland town of Hathersage. We were surprised to find that the mysterious circular building beyond the outskirts was a cutlery factory/museum/cafe, and pencilled in a visit should our rail connection go horribly wrong. The station was very close now, but access was only from the other side of the tracks which required an extra trek beneath a bridge and back again. Some running was required, such was the pressure to reach the far flung platform in sufficient time. And so we ended up, alone, standing waiting for a train that might already have gone, or might be just round the bend. I'll not reveal the ending to the story, because I like a bit of drama and because Scott will be writing all this up later - I'll let you know when. What I will say is that January may not be the ideal time to go walking in the Peak District, but by golly it's better than being sat in a dry, warm office.